The NWS has issued a HEAT ADVISORY for our area from NOON until 7 PM SATURDAY. 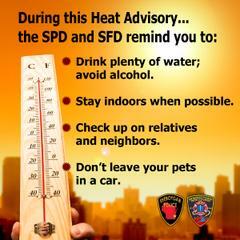 The National Weather Service has issued a Heat ADVISORY for our area. A heat advisory remains in effect from NOON today until 7 PM SATURDAY. Temps will continue to rise this afternoon, bringing the heat index at 100-105 degrees. Take extra precautions if you are outside. Children, elderly and pets are especially vulnerable. Know the signs of heat exhaustion and heat stroke. Drink plenty of fluids. In these conditions, PETS should NEVER be left unattended in vehicles under any circumstances. The hot weather will cause the interior of a vehicle to reach lethal temperatures in minutes. Please check up on friends, relatives and neighbors who may be isolated to be sure they are not showing signs of heat-related illnesses.